The construct of the group provides a different dynamic to therapy than individual sessions between a single client and therapist. Often the dynamics of the group play a part in the healing process for the individual through shared experiences and group support. Group therapy also exists using more traditional talk therapy methods. This can sometimes be a confronting environment for individuals who have difficulty sharing their experiences in public and with strangers. However, an art therapy group can help alleviate these fears when the individual can use art activities as their ‘voice’ in sharing their experiences. This can feel less confronting and safer for the individual to begin sharing with others in the group. 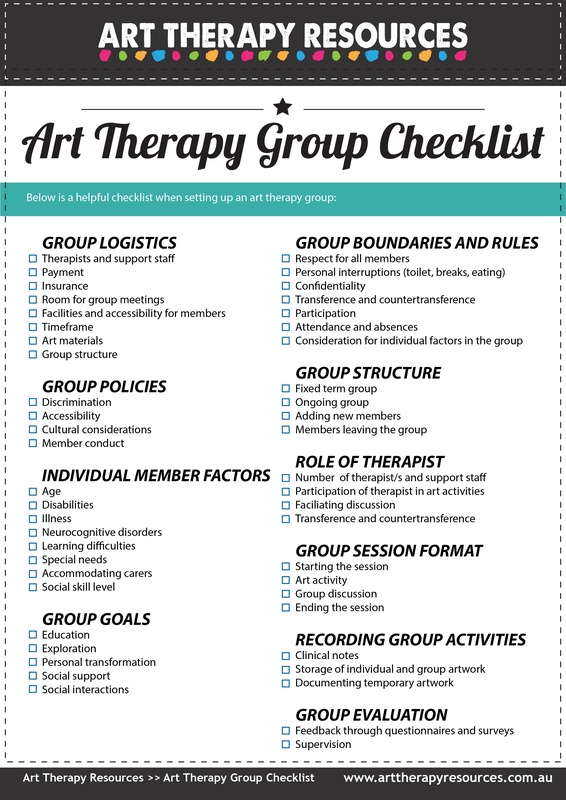 An art therapy group can provide numerous benefits in place of individual therapy or group talk therapy. All of these issues can be addressed by establishing group rules and paying attention to how individuals and the group as a whole are functioning. Group facilitator – who are the art therapists and assistants involved in the group. Define the roles of each facilitator. Group demographics – participant demographics and size of the group. ISSUES OR THEME BASED – the group meets to address specific issues or experiences such as grief, anger or divorce. This therapy is usually conducted in a shorter time frame to address a specific issue. INTERACTIVE GROUP – in this group the dynamics of the group is an integral part of the therapy process. This style is a mix of theme based and group analysis. The interaction of the group forms part of the discussion process. SOCIAL ACTION GROUPS – this style is an extension of the theme based group style and focuses on a social issue that the group may be facing. Examples include asylum seekers, natural disaster victims, and religious groups. Some of the issues you need to consider in a group setting are the diversity of the group demographics. Demographic diversity refers to race, culture, gender, age, disability, health, and religion. From a social psychology point of view, individuals will connect with group members who best resemble their own demographic. This is evidenced by women’s groups, elderly groups, and religious groups that identify with like-minded individuals. As individuals, we can benefit from exposure to other people with different backgrounds. When individuals with demographic differences gather together with similarities in circumstances, a bond can form that will help facilitate the therapeutic alliance between group members. This has occurred where communities have experienced a natural disaster such as floods. Some of the most common art therapy groups that are established are based around the logistics and psychological issues or life experiences that present as a common theme within the group. Acute psychological focused – includes groups with acute psychological issues such as schizophrenia, anorexia, psychosis, depression. 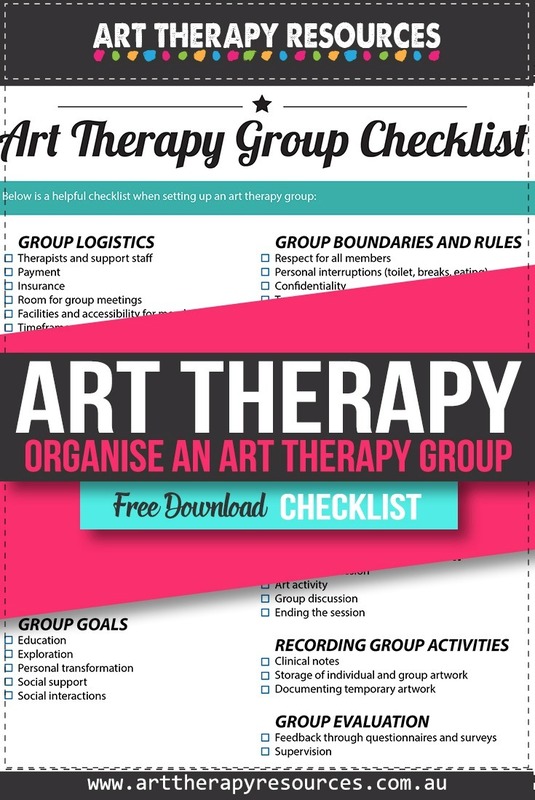 SIGN UP below to download the FREE Art Therapy Group Checklist.